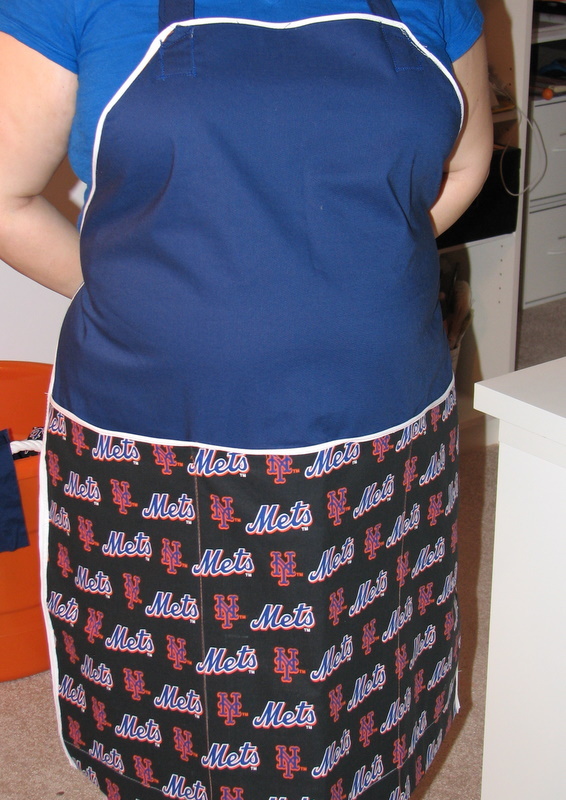 Let me start by saying that I was finally able to use up most of the white bias tape leftover from the Great Apron Fiasco of 2006. I was just learning to sew, and I decided to make my mother an apron for Christmas. 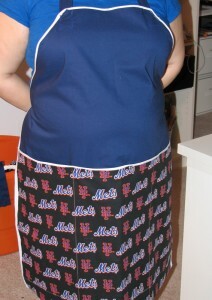 I used Martha Stewart’s baker’s apron pattern, which I also used for this apron. I constructed mine a little differently than Martha’s, and this included using white bias tape for trim around the edges. Using another Martha apron pattern I figured I would need about 145″ of white bias tape for the binding. Only I misread inches as feet and spent a very cold and rainy night in December driving to 3 different fabric stores in search of 145′ of white bias tape. One pack has 12′, so you can imagine it took a while to find enough. When I got home and opened one pack, I was horrified to realize it would be more than enough to do the job. I swore loudly, and Adam still teases me about it to this day. Too embarassed to return 10 extra packs of trim, I’ve kept it for 2 years and tried to find ways to use it up. This, by the way, is also the story I told my mother to convince her that years of saying I wasn’t good at math and logic were not all in my imagination.